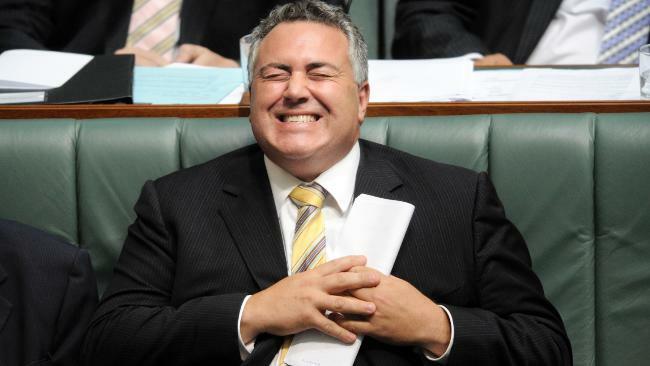 I WAS never good at maths at school, and now I’m a journalist which means I never will be (it’s true, numbers make us cry — I think it’s genetic), but I reckon even I could have a fair stab at being federal Treasurer after watching Joe Hockey this week. I may not know anything about economic theory but I’ve picked up a lot from Mr Hockey lately, such concepts as “things are easier when you’re not poor” and “if you need more money, just earn more money”, so I think I’d get the swing of it pretty quickly. The only problem is I don’t quite look the part. Because let’s be honest, for a government that’s spent the last year trying to convince people that taking services away and making everyone pay more for them is a good thing, the best spokesman is someone who literally looks like a “fat cat” from a New Yorker cartoon traipsing about smoking cigars. I’m just not sure I have that kind of relatability. n any case the position is yet to be advertised on Career One, so in the meantime I’ve taken the liberty of turning Joe’s collected wisdom into a handy guidebook — sort of like a financial Chicken Soup for the Soul (or, if you’re a pensioner or unemployed, Half a Maggi Chicken Stock Cube Soup for the Soul). News_Image_File: Cartoonist Warren Brown’s view ...News_Image_File: ... of Joe Hockey telling it like it is. If the education system in this country had any pretence to equipping children for real life, instead of pumping them full of useless information like “history” and “geography” and “how to add up”, they’d hand this essential text out in schools. Or preferably in preschools, so kids can get a head start on saving their first home deposit. As an adult, you have to make a choice between wealth and poverty. It is imperative that you make the right decision as soon as you leave school. Many people have chosen poverty to their detriment — make sure you weigh up all pros and cons before you decide. For example, advantages of wealth include being able to pay for things and not freezing or starving to death, while advantages of poverty include looking authentically hipster in op-shop clothes and involuntary adherence to the 5:2 diet. The starting point for a first homebuyer is to get a good job that pays good money. If you’ve got a good job that pays good money and you have security in relation to that job then you can go to the bank and you can borrow money. It’s easy. Upon graduating high school, try to immediately get a job as a CEO, mining magnate or government minister. This will help you afford essential things like a $5.4 million mansion on Sydney’s North Shore, and cigars to celebrate your total lack of reliance on public transport. If you can’t afford something, stop spending all your money on cigarettes and beer. Cigars are fine, though. Obviously. If you earn less than $100,000 a year, you don’t need a car. As everybody knows the poorest people don’t have cars or actually don’t drive very far. This is because they all prefer to spend hours commuting on multiple crowded trains and buses in heatwaves and pouring rain. Strange but true. It’s just one more reason to choose not to be poor. First published in The Advertiser, June 10, 2015. Click here to read the original article.